On 26th and 27th November 2013, the Archbishop of Canterbury, the Most Revd and Rt Hon Justin Welby, took part in both sittings of the Financial Services (Banking Reform) Bill’s Report Stage. On the first day of the Report Stage, he spoke about the need for the new ring-fencing structures to be supported by a ‘second reserve power’ which would give the regulator the power to fully separate all banks in the industry if one or more banks were gaming the new rules. He led a group of amendments on behalf of the Parliamentary Commission on Banking Standards, which would institute a rigorous licensing regime for significant bank employees who are not senior management. He also spoke about the need for specific measures to be developed to ensure that banks and their employees complied with anti-money laundering laws. The Archbishop of Canterbury spoke twice during the second and final day of Report Stage. He spoke in support of Amendment 164, tabled by Lord Phillips of Sudbury, which would require a review to be undertaken into the current exemptions some banks and similar institutions enjoy from the Gaming Acts, on transactions which could be understood as gambling. He suggested that a review should examine what impact he current situation has on the culture in these institutions. He also led the debate on the Parliamentary Commission on Banking Standards’ amendment on leverage ratios. He highlighted the important role that the leverage ratio plays in the ‘tool-kit’ available to the Bank of England, and warmly welcomed the Government’s announcement that the Bank of England would undertake a review into its powers to set the leverage ratio and make recommendations on what further powers it may need. The Archbishop of Canterbury: My Lords, as did the noble Lord, Lord Lawson, I begin by expressing my gratitude to the Government that they have listened to the speeches of many noble Lords and my PCBS colleagues on the need for a full and independent review of the ring-fence. I hope that they will realise that the amendments that have been tabled today are the final pieces of the puzzle in this regard. This work, combined with the vast improvements that we have seen to the electrification of the ring-fence—what is officially known as the first reserve power—is most welcome. The noble Lord, Lord Eatwell, put the case very clearly, not only for them but for the second reserve power. The Government’s approach to that is so far disappointing. The Minister said that he believed that a robust ring-fence will work, and so do we, as the commission. It is just that we do not think that it is robust—that is the problem. The point of the second reserve power is to make the ring-fence sufficiently robust that it will carry the day if the first one is over a period of years overwhelmed. The swirling floods unleashed in 2008 with the banking collapse continue to cause eddies all over our economy, particularly in the most vulnerable parts, which so many of us on these Benches are so deeply involved in supporting. Both the ICB and the PCBS concluded that the most appropriate way in which to reform the structure of the industry today is to have the ring-fence within a parent company. It is experimental —we hear the arguments, and we know so. This partial structural separation, with the added provision of ring-fence, should create a disincentive for banks to attempt to test the limits or game the ring-fence, but “should” is not sufficient. The advantage of the second reserve power and the first reserve power together, in addition to the ones that the noble Lord, Lord Eatwell, put so eloquently, is that they give a second shot to the gun. If the first reserve power fails, and a bank or two has been forced into full separation but the whole industry is still gaming the system, then you have still got the second reserve power. It appears that the Government’s policy on this is to have only one shot and then to say, following that, “We’ll do something. As yet, we know not what. But we will do something, and it will be something very, very serious”. This, however, is a structure that has to last for the next 30, 40 or 50 years. We do not want to be repeating this. We have sat here long enough over the past year. The pain of the 2008 crisis has already begun to dull. I heard a few days ago from a senior manager of a major bank that 70% of his dealers had taken up their occupation since the crash. The corporate memory will fade very rapidly. Within 10 years there will not be one at all. That brings us to the second reserve power. This amendment does not include the appropriate split for the full separation power in the Bill. We recognise that it has already been said, and I agree with that point, by Lord Flight, that what is appropriate now may not be appropriate in five years’ time. We cannot tell exactly what will be necessary. That is why the review should be a broad-based review that includes the possibility of a full separation. The Government have argued, and will argue, that full separation is something of a game changer and that such change should and can only come through primary legislation. The threat of action, however, against the industry gaming the ring-fence must be greater than the current perception, which appears to be one, as far as the banks are concerned, of “Well, if we have gamed the system universally, if there is the political will and the legislative time, and our lobbying efforts fail, then the Government might produce a Bill, and then we might be in trouble”. The inclusion of full separation in the inquiry provides a certain measured, proportionate and existential threat which makes it clear that gaming the ring-fence will be a serious mistake for the banks to make. We have already heard that, in doing this, we create an added incentive of a self-regulating and self-policing atmosphere within the banking industry. The idea that banks do not watch each other is, as the noble Lord said, incredible. When I was in the banking business 35 years ago, the first thing I learnt from my Norwegian boss was, “These banks, they are like sheeps. They all follow each other”. His English was perfect except that he could not handle the plural of “sheep”. I remember that and remember observing that, like all good competitors, if they saw a good thing they moved into the same space. It is how the industry works and how we want it to work. The second reserve power is a vital component in the structural reform of our banking sector. I urge the Minister to look again at this recommendation of the PCBS. They have gone so far. Surely to add the possibility of full separation in the review is only a further small step and a very reasonable one. Recognising that we are trying to build a banking system for the next half century, not for the next five years, I urge the House to support these amendments. The Archbishop of Canterbury: My Lords, Amendment 50 is in my name and those of the noble Lords, Lord Turnbull, Lord Lawson of Blaby and Lord McFall of Alcluith. It clarifies the scope of who the new senior persons regime will apply to, to ensure that it is rightly focused on material risk-takers, not on all bank employees. I will also speak to Amendments 51 and 60 which stand in my name and those of the noble Lords as colleagues on the commission. Amendment 51 sets out the duties relating to the application of the new licensing regime for the banking regime. Amendment 60 also deals with clarifications in the scope of the senior persons regime. In Committee, on a day that I was unfortunately unable to attend owing to having to baptise someone, my noble friend Lord Turnbull welcomed many of the Government’s proposals relating to the functions of senior managers in banks, including ensuring that senior managers have a statement of responsibilities and the reversal of the burden of proof on whether a person is fit and proper to take up a senior management position. We are very grateful for that. However, my noble friend Lord Turnbull also raised a number of questions that I hope can be adequately answered today, although I realise that there is still a lot of reflection going on in this area. “appears … to be necessary or expedient”. As both Amendment 50 and Amendment 60 deal with our concerns around the application of these rules to any “employee of the bank”, let me turn to the issues that this language raises. the amendment is aimed at ensuring that the FCA and the PRA focus their regulatory duties on those employees who could inflict the most significant and material damage on their institutions and on the banking system as a whole. These are not always the most senior employees. They could be a junior dealer, fairly new in the business, who, ignoring his internal limits, deals in a way that does great damage both to customers and to his employer. He can be fired and even sent to prison, but the deals are still the responsibility of the bank. It is therefore necessary to have an amendment that not only widens beyond the senior management, obviously, but narrows so that it does not try to cover all the employees but has a very focused look at those who are going to be able to do the most damage the most often, and who are at highest risk. In our regular and ongoing conversations with the regulators and in the light of their official responses to our work, the commission has not yet been convinced that they would go far enough to ensure that this specific group of material risk-takers would be central in any further regulation and thus that neither the spirit nor the letter of the commission recommendations would be implemented. Amendment 51 seeks to correct the failings of the approved persons regime that this new two-tier system replaces. The noble Lord, Lord Turnbull, also stated previously that this regime operates mostly as an initial gateway to taking up a post rather than serving as a system through which regulators can ensure the continuing exercise of responsibility. made by the regulator, the amendment makes it clear that the rules of conduct for material risk-takers who are not senior management are just as seriously applied as those governing senior management. This gives a clear identity to the new second tier of the system, which is vital if it is to be taken seriously by regulators and banks. As I said a few moments ago, I am aware of ongoing conversations between my colleagues and the Treasury over a few remaining issues around the implementation of the licensing regime. I believe that these are mostly in relation to the most appropriate names for the licensing regime and the senior persons regime and, I hope, to some of the matters that I have raised this afternoon. I hope that the Minister will be able to update the House on these areas and that the news can be welcomed by myself and my colleagues. 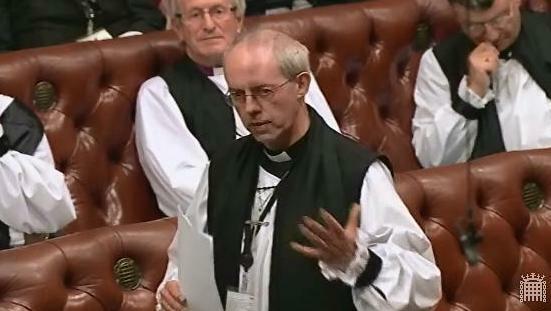 The Archbishop of Canterbury: I have already spoken to the amendment standing in my name. The members of the commission are delighted that the Government are broadly finding agreement with their recommendations, and on all the areas on which the Minister spoke we hope and expect that the government amendments at Third Reading will reflect closely the assurances that we have been given. To ensure that we get this right, we re-emphasise the need to see the amendments as early as possible and reserve the possibility, if we are not content and feel that they do not reflect what has been said, of returning to them at Third Reading. If I have those assurances, I will be happy to withdraw the amendment. I beg to move. Lord Newby: You have those assurances. The Archbishop of Canterbury: I beg leave to withdraw the amendment. The Archbishop of Canterbury: I want briefly to add my support to the amendment of the noble Lord, Lord Brennan. Money laundering affects not only the areas that have been mentioned, but in my 10 years’ experience of dealing with conflict management and mitigation work in Africa, it was particularly significant in the ways in which illegal regimes or militias managed to fund and supply themselves. My experience, particularly in some parts of Africa, has shown that London, over time, as one of the deepest and most liquid financial markets on earth has, contrary to the impression given by many senior bankers, played a significant role—not through their collusion in any way at all, but because of its size and the complexity of preventing it. I believe that this amendment and the suggestions put forward by the noble Lord, Lord Eatwell, will contribute extensively to restricting that. The Archbishop of Canterbury: My Lords, I add my support to what the noble Lord, Lord Eatwell, said in specifying these particular contracts, not only for their tax avoidance capacity but because participation in them within the trading community leads to obvious conflicts of interest between their main work during the day, for their employer, and any potential gains or losses they have through the spread betting operations which they are capable of undertaking. In other words, it is very much a cultural problem and it is specifically to do with contracts that are considered to come under the purview of the gaming Acts. That is how I understood this amendment to apply, rather than more generally. From my point of view, I am not certain that it needs to be in the Bill, but it would certainly be useful if the Government were to say that the scope and impact of this should be looked at. The Archbishop of Canterbury: My Lords, this amendment stands in my name and in the names of the noble Lords, Lord Turnbull, Lord Lawson and Lord McFall. The issue of leverage ratios may at first sight be less emotionally gripping than some of the other things that we have been discussing over the past few days, but it is central to the recommendations made by the commission. The leverage ratios that banks employ are a vital backstop in ensuring that they hold adequate capital, and ensure the safety and security both of individual banks and the industry as a whole. A remarkable lecture given by Andy Haldane of the Bank of England sets out the necessity for this amendment. It is called The Dog and the Frisbee and I warmly recommend it, not least for its light humour. Essentially, as the Basel process has gone on through Basel I, Basel II and Basel III, there has been an exponential increase in the complexity of the internal measurements of different categories of loan for the amount of capital that had to be set against them. This opened the way very effectively to banks using different internal measures and to the inability of regulators to audit and examine adequately the ways in which banks were setting aside capital for particular risks. A leverage ratio, because it is relatively if not absolutely simple, acts as a backstop which sets minimum levels of security and safety. The debate around a similar amendment in Committee was rather confusing. Although, as I have mentioned previously, I was unfortunately not able to be in the House that day owing to other duties, I have looked at the Hansard andconcluded that the Government’s position on this recommendation seems unclear. On the one hand, the House was told that the amendment was not needed, as the Financial Policy Committee had the power to set the leverage ratio; on the other, the Minister indicated that responsibility for setting the leverage ratio would be considered once the international levels were implemented through Basel III, which would be some time in 2017 or 2018. In the light of this, the commission warmly welcomes the clarity of an announcement made yesterday that the Financial Policy Committee will conduct a review into the role of the leverage ratio within the capital framework of UK banks, as this indicates that the Treasury and the Government recognise that they are an important part of the structures that guide the banking system and that it is necessary that we move forward without delay. My commission colleagues and I are grateful to the Government for their willingness to allow the FPC to conduct a thorough and wide- ranging review of its current powers and to make recommendations on further powers it needs. We would welcome a clear statement that the review will not seek to establish whether it is right for the FPC to request this power but that it will have the power and the review will be about how it will exercise it. We also welcome warmly the accelerated timetable set out in the Government’s announcement. It is right that this power should be available to the FPC as soon as possible and the expectation that the Bank of England will complete its review within 12 months reflects this need. I hope that the Minister can confirm these points. I beg to move. The Commercial Secretary to the Treasury (Lord Deighton): My Lords, the amendment would require the Government to make an order giving the FPC a power to direct the PRA to set a leverage ratio within six months of Royal Assent. It is absolutely the case that it will be the FPC which exercises these powers. It has never been the intention that the Treasury would have those powers. For those who are not so familiar with the context, I shall have another go at being less confusing about the background, because it is important to understand why the review is necessary to get to that end case and what the current situation is. There was a lot of concern around the idea that the Chancellor has the power to set a leverage ratio, which I think was in part a result of some confusion about how the law currently stands and works—which in turn is partly because of the various domestic and international reforms running to different timescales. We are in a process of change and a lot is moving around. I tried last time to clarify the current powers of the regulator and the future powers of the FPC during Committee. I thought that I nearly succeeded, because I think that the noble Lord, Lord Lawson, is on record as saying that he was encouraged to some extent. That was a ringing endorsement compared to how I did on some of the other amendments, so I thought that I had done quite well. The Government have sought to provide further clarity on this point through the recent exchange of letters with the Governor of the Bank of England. I will return to that. I hope that, with that explanation and a description of the steps that the Government will take to clarify matters further, I can satisfy your Lordships that their concerns about what I agree is a very important issue will be addressed. First, I shall try to explain the current state of the law. Then I will explain our proposals in that context, because I think that that will give noble Lords the full picture. Under current law, three bodies are concerned with the leverage ratio: the Treasury, the FPC and the PRA. Of course, the last two are part of the Bank of England group. Of those three, one has the direct power to set a minimum leverage ratio now. That is the PRA. Let me make it absolutely clear: it can do that not just on a firm-specific basis but on a system-wide basis. It can do that now; it has that power. It can set the leverage ratio directly, as it did back in June, or on the basis of a recommendation from the FPC. When I replied to the noble Lord, Lord Turnbull, I talked about the June action of the PRA as the killer fact; it was obviously not as emphatic as I hoped. Under FiSMA, the FPC has two sorts of powers. First, there is a wide power of recommendation on any issue with regard to financial stability, which it makes to the PRA to exercise under its powers on a “comply or explain” basis. For that to work, the PRA must have powers to apply rules across the whole sector, which, as I have just explained, it does. It is envisaged that that is how most of the FPC’s decisions will be enacted. Secondly, the FPC has a narrow set of macro-prudential tools, which are powers to direct the PRA to act. There are currently two powers of direction. Currently, they are a counter-cyclical capital buffer and sectoral capital requirements. The Government also committed—this was the original situation—to giving the FPC a third direction tool to vary the minimum leverage ratio once the minimum was set in 2017. For the avoidance of doubt, the Treasury plays no role here. If the PRA wants to set a leverage ratio either under its own initiative or under the recommendation of the FPC, it does not have to ask the Treasury, and the Treasury has no veto. The Treasury is the only body of the three that does not have the power or influence to set the leverage ratio. So the debate is essentially about how and when the Treasury grants the FPC that specific power of direction over the PRA, rather than the PRA retaining some discretion in the matter. That being established, let me turn to the Government’s recent exchange of letters with the Bank of England. The Government have already committed to give the FPC the power to vary the leverage ratio. The Treasury is the only body of these three that does not have the power or influence to set the leverage ratio. So the debate is essentially about how and when the Treasury grants the FPC this specific power of direction over the PRA, rather than the PRA retaining some discretion in the matter. That being established, let me turn to the Government’s recent exchange of letters with the Bank of England. The Government have already committed to give the FPC the power of direction to vary the leverage ratio through time in 2018, subject to a review in 2017, but, given progress internationally—all the transformational change that we just discussed—there is a case for such powers being given earlier, or specified in a different form. To settle this debate, the Chancellor asked the governor, who is the chair of the FPC, to review the matter and make a recommendation to him that he could take to Parliament. The Government believe that that is the right approach to granting the FPC additional powers of direction, for a number of reasons. First, there is an existing process for the FPC being granted such powers, established under the Financial Services Act, which many in this House and the other place, including the chair of the PCBS, helped to design. These are prescribed by the Treasury by order under Section 9L of the Bank of England Act 1998. Before making an order, the Treasury must consult the FPC and make an order in Parliament. This is subject to the affirmative resolution procedure, so must be approved by each House of Parliament. To fulfil their duty of proper consultation before bringing a proposal under the Act, the Government believe that it is appropriate and necessary that the Bank furnish them with the relevant information from the planned review of the leverage ratio. As noble Lords can see from the governor’s response to the Chancellor, he is more than happy to go along with that process, given the things that are going on this year. Secondly, as a matter of policy, there are a number of outstanding technical issues that will need to be settled before the Chancellor can bring fully fleshed-out proposals back to Parliament. It would be helpful if I explained some of the technical issues which are alluded to in the Chancellor’s and governor’s letters. The first issue to fix is: at what level should it be set, relative to risk-weighted requirements? That is not currently settled internationally, which is why the Basel process and the European Banking Authority are going through a long process of review and calibration. We envisage that the FPC would have to consider this too for the UK and, most importantly, explain the circumstances in which it would wish to set a higher level for UK banks, if it believes that necessary. Secondly, if this is a macroprudential tool, how will it operate? If the tool gives the FPC the power to direct the PRA to vary the leverage through time, it will need to be clear under what circumstances it would be varied and how it will interact with other tools such as the countercyclical capital buffer, which does a similar thing for the risk-weighting framework. Thirdly, there is the important question of timing. The international timetable will set a minimum in 2017-18, so there is a question for the FPC as to what the right timetable is for the UK and how it should get there. These are very important and technical questions in the design of a leverage tool. Once that review has provided evidence to support its recommendations, the Government have committed that they will use their existing powers to grant a power of direction to the FPC before the end of this Parliament. I have a note next to me confirming that the Chancellor is happy with “when”. That is probably what noble Lords really wanted to hear but I thought that it would be useful to have some background. That timetable fits in with the FPC’s own timetable for defining the medium-term capital framework for UK banks. The governor has confirmed, in his letter to the Chancellor, that this timetable is appropriate. I hope that on the basis of all the background information that I have provided, which I hope gives the context for a very specific answer to a specific question, your Lordships will be comfortable in withdrawing this amendment. The Archbishop of Canterbury: I am very grateful to the Minister for such an extremely technical answer and I beg leave to withdraw the amendment.